A thuismitheoirí! Fé mar is eol daoibh tá níos mó spáis againn anois do phairceáil. Tá ag eirí go maith leis cheanna féin ach teastaíonn uaim go mbeidh gach éinne ar an eolas faoin gcóras atá ceaptha chun an tairbhe is mó a bhaint as an spás iontach nua atá ann. Ní cheart pairceáil ar an taobh ón áit a bhíonn mo ghluaisteáin/ áit pairceála an P.O. ar aghaidh. Ní rabhamar in ann comharthaí a cur in áirde san ait san ach ba cheart go bhfágfaí saor í i gcónaí. Tá pictiúirí thíos ag míniú an coras. Tá súil agam go bhfuil sé soiléir daoibh! Dear parents, As you all know we have acquired more space for parking. For the most part it is being used appropriately already but I just want to make everyone aware of the system we are implementing in order to take full advantage of the extra space. There is no parking along the side from where my car/ P.O.’s car is parked as far as the road. We have been unable to put up signs from that space down but it must be left clear at all times. There’s a picture below that explains the system. I hope it explains it for you! Beidh traenáil iománaíochta ar siúl amárach, Dé Céadaoin, an 29ú lá de mhí Eanáir, 2014 i gcomhair Rang a 4. Beidh sé ar siúl i halla Naomh Multose óna 9 - 10 a chlog ar maidin. 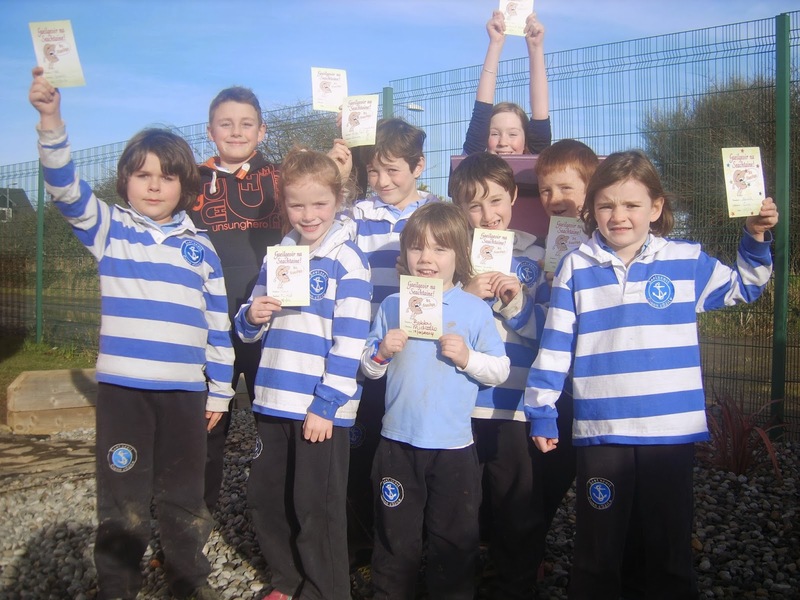 Tabhair ar scoil mar is gnáth iad mar tá síobanna eagraithe againn dóibh. There will be hurling training tomorrow, Wednesday, the 29th January 2014 for 4th Class. It will be in St. Mustose Hall from 9 - 10 in the morning. Bring the children to school, as per usual, as there are lifts organised for them. Meabhrúcháin/ Reminder- Do This in Memory Mass- First Holy Communion. Tá aifreann ar an Satharn seo, an 25/01/14 ag a 6.30. Léigh lch 22-25 sa leabhar Thumb le do pháiste. Tabhair leat é chuig an aifreann le bhur dtola. Labhair le do pháiste faoin a bhaiste le bhur dtola. Tóg buidéal uisce beannaithe ón altóir taréis an aifreann. There is a D.T.I.M mass this Saturday the 25/01/14 at 6.30. Please read pages 22-25 in the Thumb book with your child. Please speak to your child about their baptism. There is no need to bring an empty bottle with you, Fr. Robert has said that he will supply the bottles of holy water. You are welcome to take a bottle from the altar after mass. Más rud é gur tháinig aistriú ar do sheoladh / d'uimhir teileafón / do sheoladh ríomhphost - ón tam gur chláraigh tú do leanbh / leanaí sa scoil agus nár inis tú don scoil é, seol an teolas nua chuig Hilde ar an spota le bhur dtola. If you changed address / telephone number / email address - since you registered your child/children at the school and you haven't informed the school, please send in the updated information to Hilda immediately. Tá Oíche Eolais do thuismitheoirí ar Shábháilteacht agus ar Bhulaíocht ar líne á chur ar fáil sa scoil ar an gCéadaoin an 26ú Feabhra 2014 óna 6.30-8p.m. Is oíche ana thabhachtach é seo agus táimid ana shásta a bheith in ann é a chur ar fáil. There is a workshop / information evening for parents on Cyber Safety and Cyber Bullying at the school on Wednesday 26th February 2014 from 6.30 to 8 p.m.. This is a very important evening and we are very happy to be able to make it available to you. 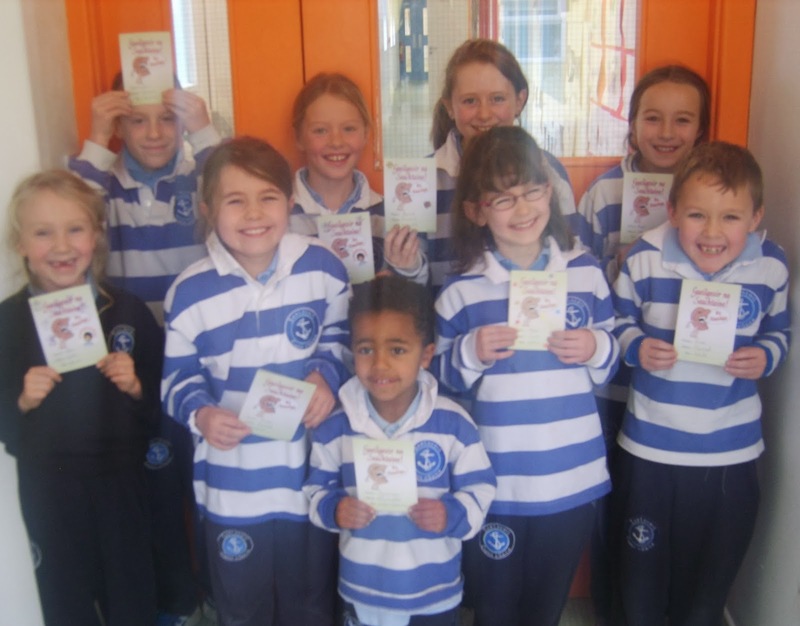 Seol thar nais ar scoil iad roimh an Aoine, 24.01.2014, le bhur dtola. Beidh buachaillí rang 4 ag dul go dtí Halla Naomh Multose amárach, Dé Céadaoin an 22ú de mhí Eanáir 2014, óna 9 - 10 a chlog ar maidin. Beidh éide spóirt agus clogad uatha (má thá cheann acu sa bhaile). 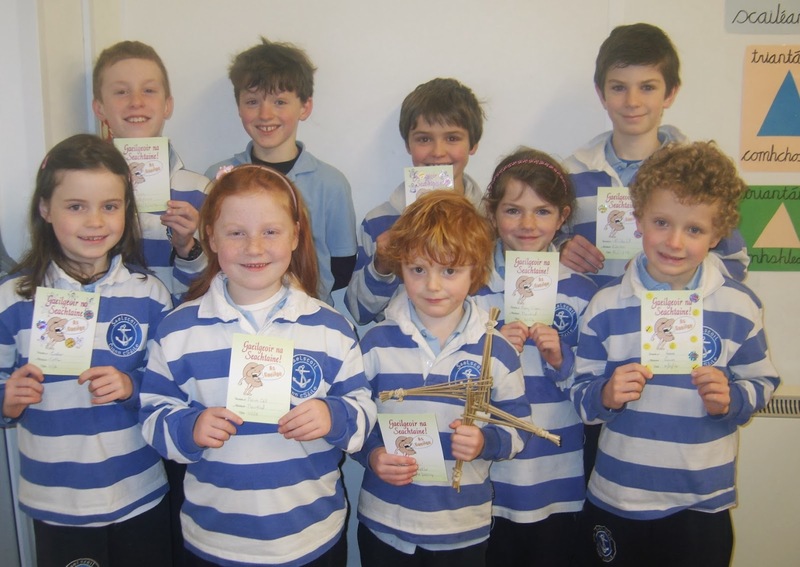 Tabhair ar scoil mar is gnáth iad mar tá síobanna eagraithe againn dóibh. 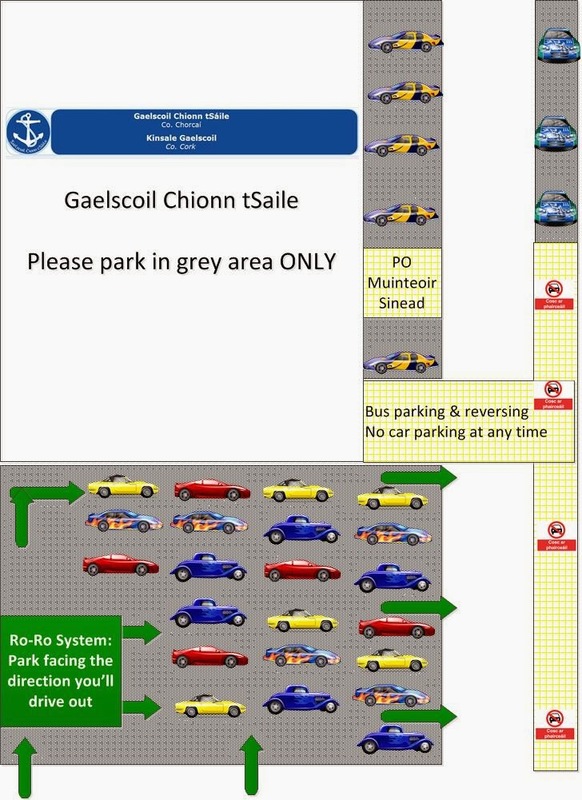 The boys in 4th class will be going to St. Multose Hall tomorrow, 22nd January 2014, from 9 - 10 o clock in the morning. They will need their sports clothes and a helmet (if they have one at home). Bring them to school as per usual as we have lifts organised for them. Beidh cailíní R4 ag traenáil i halla Naomh Multós ar an gCéadaoin, an 22ú de mhí Eanáir 2014 óna 9-10 a chlog ar maidin. Beidh éide spóirt uatha agus clogad má tá ceann acu sa bhaile. 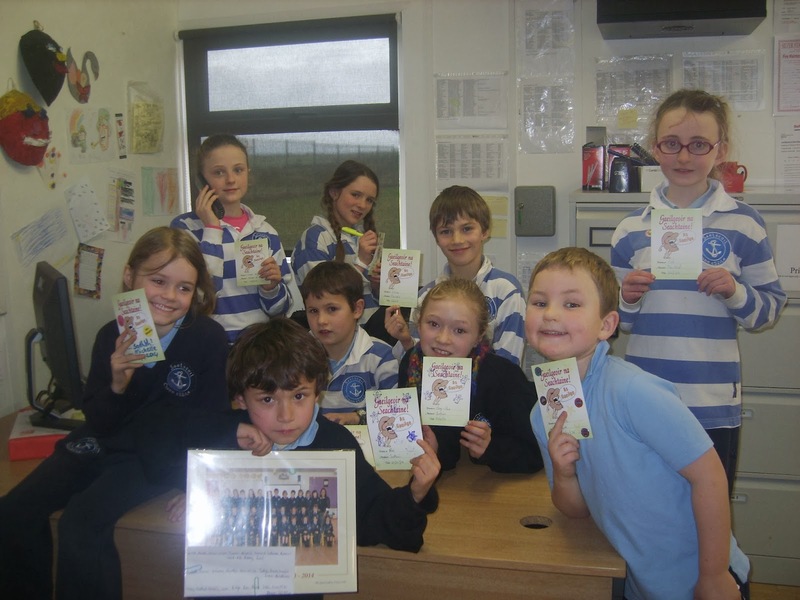 Tabhair ar scoil mar is gnáth iad mar tá síobanna eagraithe againn dóibh. The girls in 4th class will be training in St. Multose hall this Wednesday, 22nd January 2014 from 9-10 o clock in the morning. They will need their sports clothes and a helmet if they have one at home. Take them to school as per usual as we have lifts organised for them. On behalf of SVP Kinsale I wish to thank the families, pupils and staff of Gaelscoil Chionn tSáile for the generous donations of food and gifts to our organisation for distribution at Christmas. We would like to wish you and your family every blessing and happiness in the new year. As our preparation for your child's first Holy Communion continues, the next Do This in Memory Mass will take place on Saturday 25th January, 2014 at the 6.30pm Mass in St. John the Baptist Church. This week is also the start of Catholic School Week, when we celebrate the great gift of Catholic Schools in our parish and the tremendous work being done there. The theme this year: Catholic Schools-Places of Faith and Learning, reminds us that a school is not just a place where lessons are taught, but that it is a place of faith and plays a very public part of the ministry of the Church in Ireland. Encourage your child to learn the prayers before and after Communion that you will find at the end of The Alive O Religion Book. Please arrive at least 10 minutes before the start of Mass and take your place towards the front of the Church. We would ask each child to sit with their family until the Priest invites them to stand at the altar for the Gospel. The children will return to sit with their family after the homily. We observe silence during parts of the Mass as a mark of respect for Jesus, to listen to the Word of God and to create a prayerful atmosphere for all those attending Mass. At the end of Mass the children will be asked to collect and take home a small plastic bottle of Holy Water at the altar. Also, please remind your child to collect their copy of the Grapevine at the altar after Mass. PS: 'Feilíre 2014' / '2014 Calendars' are still available. 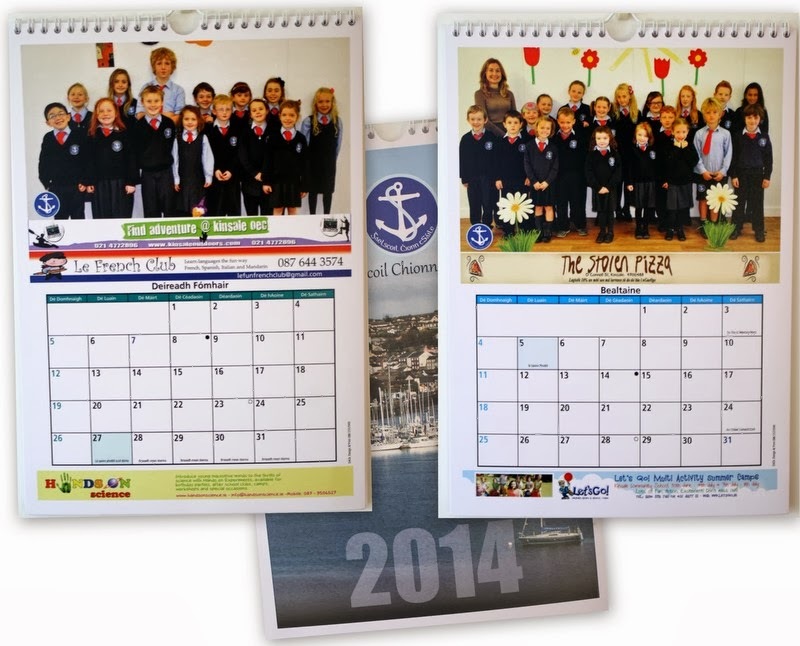 Contact the PA pa@gaelscoilchionntsaile.ie if you would like to purchase one at just €10 per calendar. They will also be sold at the scoil during the parent/teacher meetings next week. All profits will benefit the school & your child. The faulty router was replaced today and the school is back online again. If you are trying to contact the Gaelscoil via e-mail please note that the school is experiencing internet connectivity problems all week which are being worked on by their provider. In the meanwhile if you need to contact the school please use the main phone number listed on the school website under 'Teagmháil / Contact'.